A. J. Green is an American football wide receiver for the Cincinnati Bengals of the National Football League. He was selected fourth overall by the Bengals in the 2011 NFL Draft. Green played college football at the University of Georgia. Green finished the 2010 season with a team high 57 catches for 848 yards and nine touchdowns. 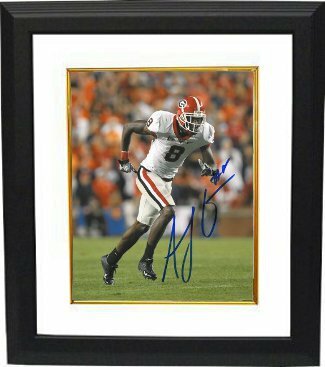 AJ Green has hand signed this Georgia Bulldogs 16X20 Photo. JSA Hologram & JSA Certificate of Authenticity. Custom White Mat and Premium Black Frame as shown.